Let’s talk about e-mail – e-mail is still the most commonly used means of communication which we use to exchange information with colleagues, customers and partners. Several initiatives have been launched in recent years to replace e-mail by supposedly better tools, and yet we still spend much of our time on our PCs or laptops in Outlook (or another e-mail program), struggling to manage the flood of e-mails. It is not that e-mail is a bad tool per se, it is just that with the passage of time we have overloaded it with things for which it was not actually designed. 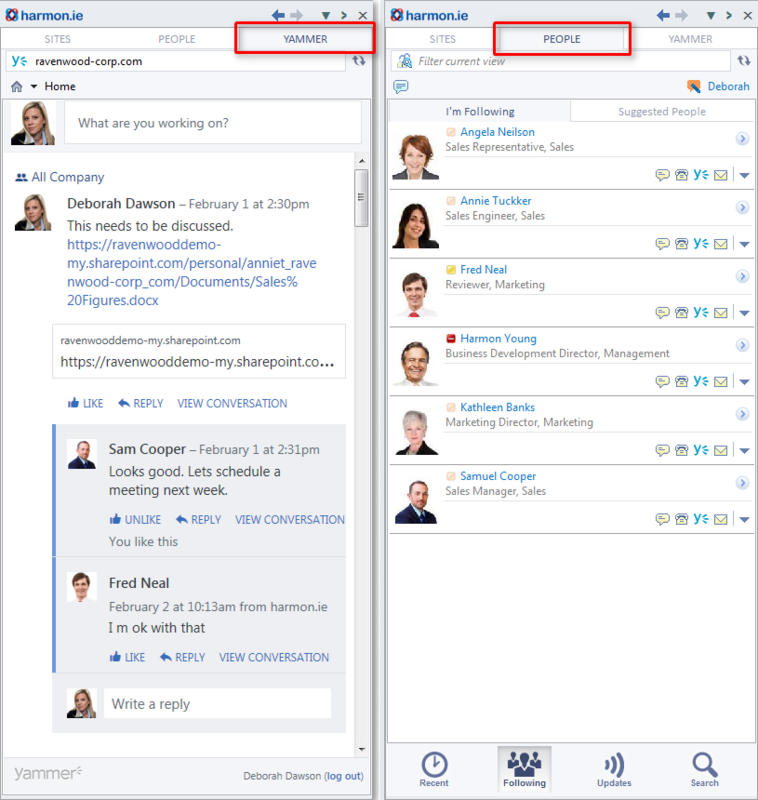 New tools like Yammer, SharePoint or OneDrive have been added, which connects us with parallel communication channels such as team workspaces or activity streams. In practice, this leads to acceptance and adjustment problems, because where we previously worked in one application—Outlook—we now have to switch between different tools. This is where harmon.ie offers a solution, putting all communication channels back into one application on the desktop in Outlook or on mobile devices in one app. 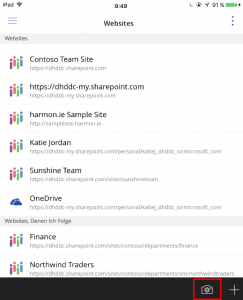 With this integration, harmon.ie also solves another general problem, because in practice, documents are stored in project sites in SharePoint, Office365 or OneDrive, even though communication with team members via internal and external e-mails usually still happens through local mailboxes. harmon.ie makes no distinction between documents and e-mails, which means that it is just as easy for the user to store a document either in the project site or as an e-mail. How does this look in practice? 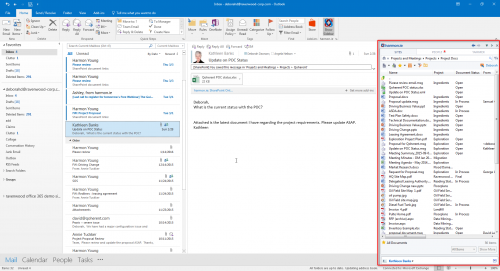 harmon.ie, with an add-in for Outlook on the desktop, offers a fix for these problems and connects Outlook via the side bar with SharePoint, Office365 and Yammer. In this way, the user directly accesses their documents in SharePoint libraries, on OneDrive, in Office 365, and Office 365 Groups via their Outlook access. And not only can they read the documents, but can also upload new documents or share them with other users. There is no need for a time-consuming switch between different browser windows or applications; everything can be managed in one application (Outlook). As already mentioned, e-mails and documents are treated equally in harmon.ie. 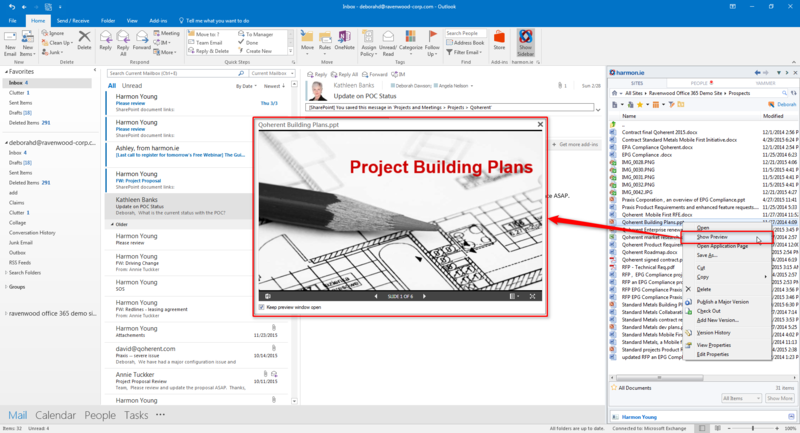 Documents can be saved or archived from the desktop or from Windows Explorer by dragging and dropping onto the sidebar in Outlook to a SharePoint library (or OneDrive, etc.). 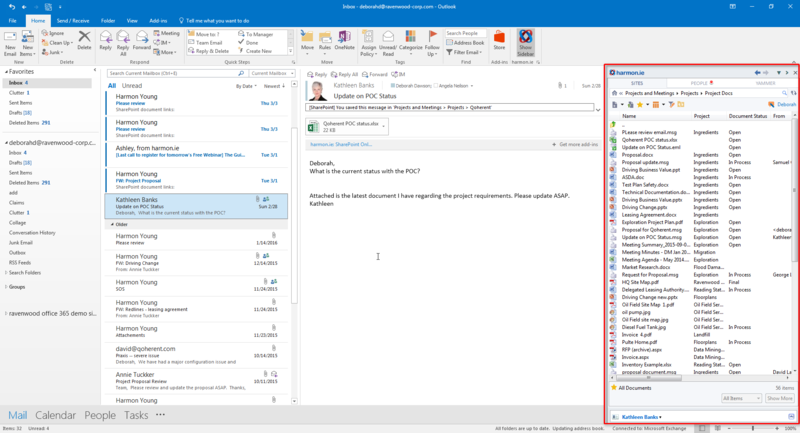 E-mails can be just as easily saved and archived in SharePoint libraries by dragging and dropping the e-mail from the Outlook inbox onto the harmon.ie sidebar. In the process, the e-mails are saved as .msg files and any attachments are saved as files in the SharePoint library. 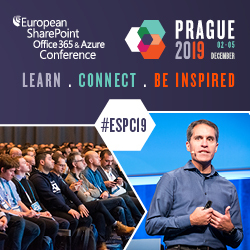 A reference to the archive location is entered into the original e-mail so that the connection between the e-mail and SharePoint site is visible. When sending e-mails, they can be saved automatically in SharePoint; a dialog window opens the harmon.ie add-in when saving or sending an e-mail. 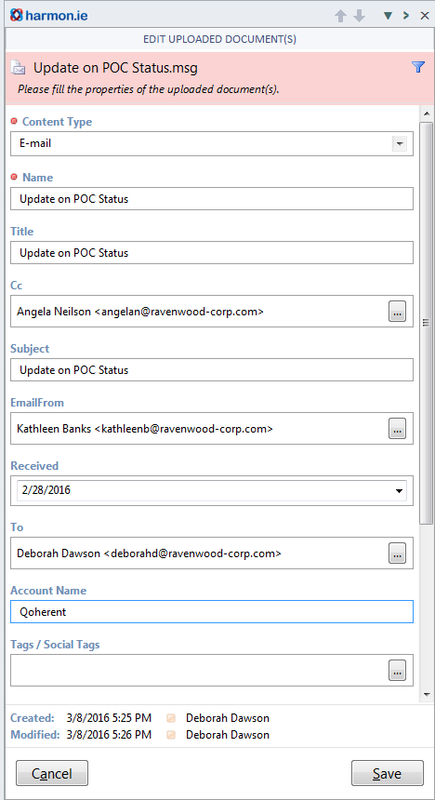 With outgoing e-mails, attachments are replaced by links to the documents in the SharePoint library. 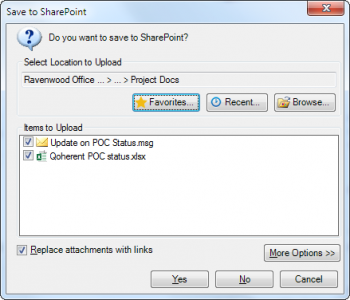 Sending links instead of attachments relieves e-mail traffic, and documents can be made available via the SharePoint library for other team members or external parties. The chaos of various document versions is prevented by all team members only having access to the latest and most up-to-date version Plus it eliminates data leakage. In all three cases, harmon.ie also supports tagging with metadata. When uploading e-mails and attachments, the metadata template automatically opens. The data can also be entered or edited by the user; e-mail metadata such as sender, recipient, subject and date of receipt are automatically applied. 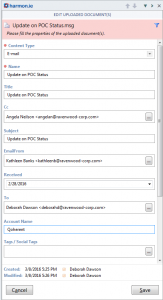 For this purpose, harmon.ie provides a list template which is prepopulated with the common e-mail fields as column headers (installation instructions and download can be found at https://harmon.ie/map-E-Mail-headers-sharepoint-metadata). The metadata for each document in a SharePoint library can also be edited retrospectively, directly from the harmon.ie sidebar via the „Edit properties“ function. 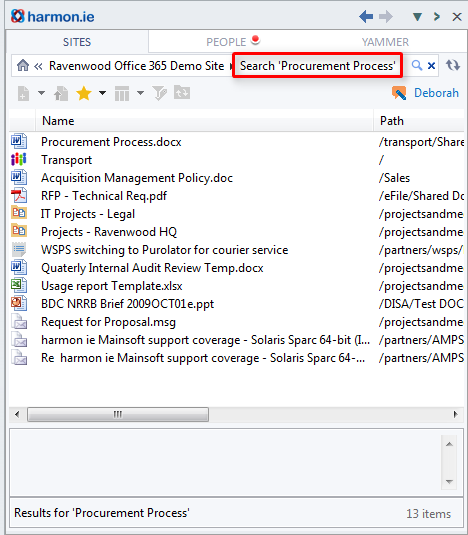 In the search bar, the user has direct access to the SharePoint search functions which support searches for documents, list content, and people linked to the specified context. 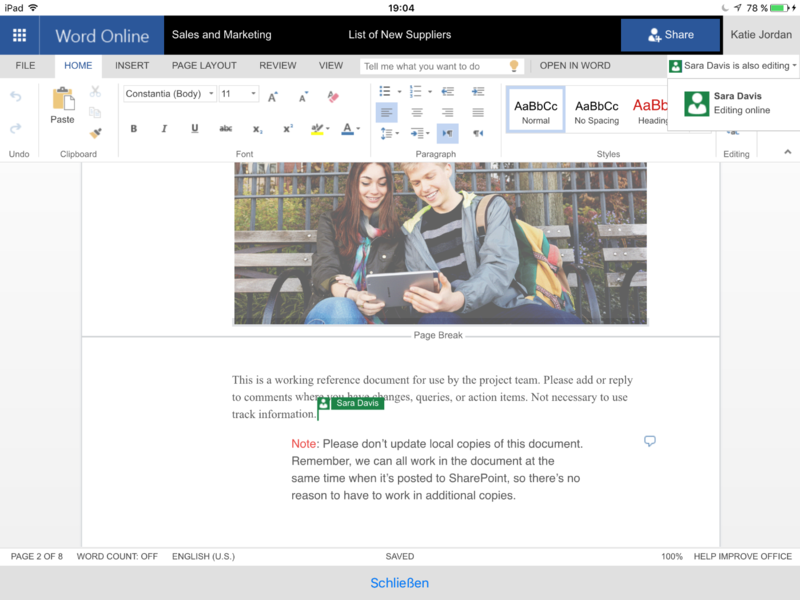 Another useful feature is the document preview where the user can view documents directly in Outlook via the Office online app, without having to previously download them to the client computer. 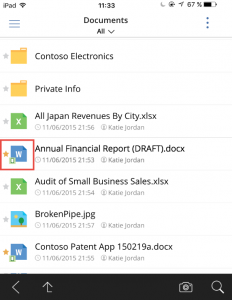 Documents that are stored in OneDrive can be released by the user via the harmon.ie sidebar for other users, and changes to the document can be easily followed via the version history. 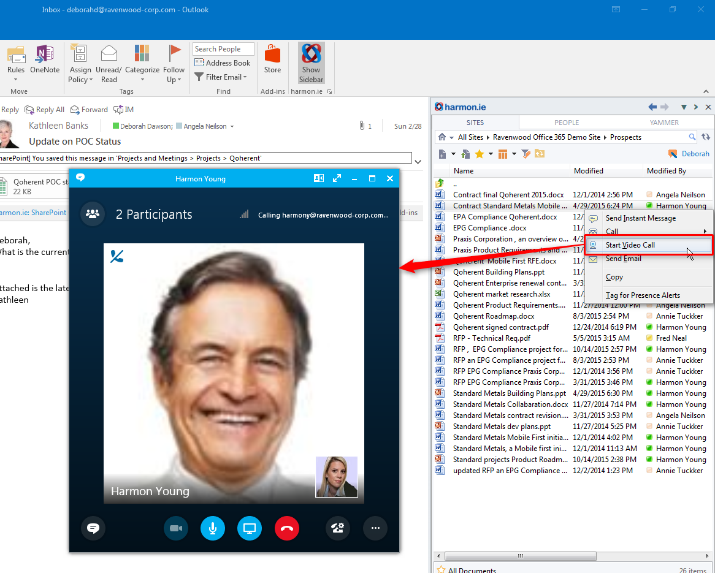 It is not only possible to save and archive documents from harmon.ie; direct contact with colleagues via Skype for Business is also supported either via an instant message, a phone call or a video call. All relevant contact information is provided in context in the sidebar and the link can be set up with a single click. 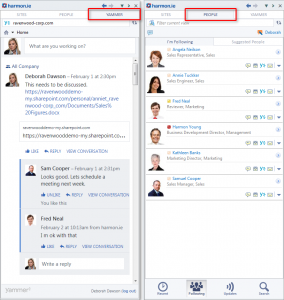 In addition, the various social features can be accessed via the „People“ and „Yammer“ tabs. „People“ shows information from the SharePoint profile of the user, such as the contacts that they follow, their news feed, and updates from their favorite sites, libraries or lists. 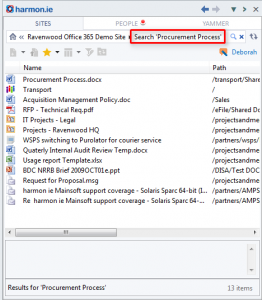 Using the search function, the SharePoint profiles can be searched for skills, current projects or functions and an appropriate contact within the company can quickly be found. And of course, the user can also update their status message from the sidebar. If the company uses Yammer, then the company’s Yammer activity stream and the user’s activity stream are both displayed in harmon.ie. Here, too, the user can actively access their social network, change their status and like or comment on contributions from colleagues. In the era of „Mobile first, Cloud first,“ access to SharePoint and Office 365 via mobile devices is increasingly becoming the norm. 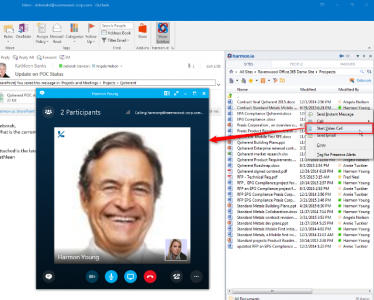 harmon.ie offers 10 apps for iOS, Android, Windows Phone and Blackberry that merge various communication channels in one application, like on a desktop. Taking the app for the iPad as an example, we’ll take a closer look at the main features (the app for Android offers similar features). 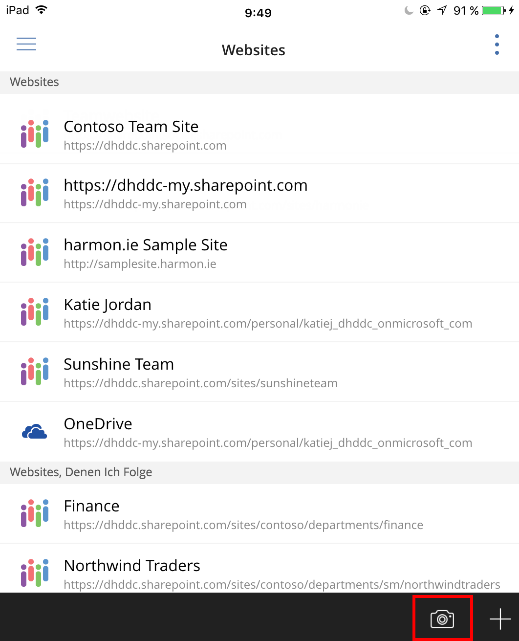 Links can be set up to websites in SharePoint, Office365, Office365 Groups, OneDrive and Yammer in the iPad app. 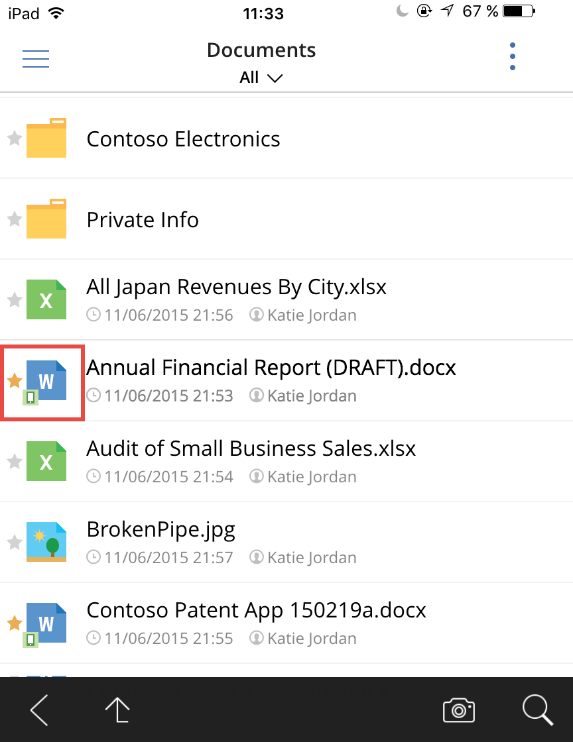 Apart from documents, users can also access the content lists. 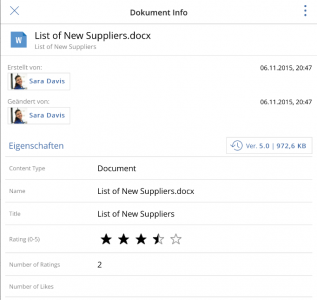 The potential of the iOS platform can be exploited to the fullest when working with Office documents. Word, Excel and PowerPoint files can be opened and edited directly from the harmon.ie app or, if installed, with local Office apps. Even if no network connection is available, the user can continue working on their documents with the harmon.ie app. An offline feature is provided where individual documents, folders, libraries or lists can be configured for offline use. The offline documents/items are grouped under favorites, marked with a Smartphone icon, and downloaded to the mobile device. Not only can PDF documents be displayed on the integrated viewer, but also provided with notes, highlights and annotations. 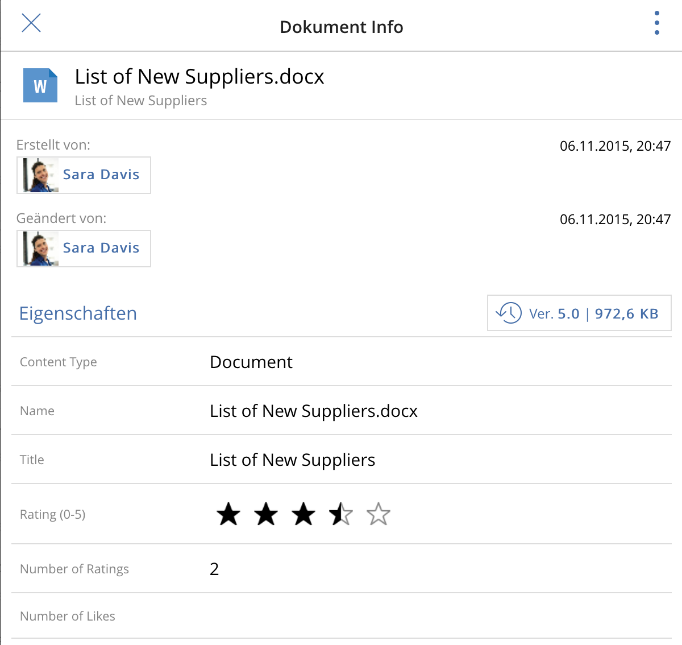 If the documents are stored in an online repository, they can be easily shared with other users, and collaboration features such as shared work on Word documents can be used. Through the harmon.ie app, the user has access to the version history, can view or edit the document properties and metadata, and conveniently use social functions such as the rating of documents. Finally, it should be mentioned that photos can also be taken with a smartphone or tablet from the harmon.ie app and uploaded directly to SharePoint or Office 365. SharePoint, Office 365, OneDrive, Yammer, e-mail—we have increasing options to save information and documents on the Microsoft platform. With harmon.ie solutions for Outlook and mobile devices, access to these resources is greatly simplified because all activities within the Microsoft platform can be performed using an application or an app. It is no longer necessary to switch between different tools. 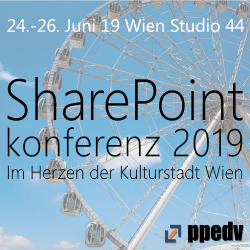 This significantly increases the acceptance of SharePoint, improves usability, and enables more effective and more productive work, regardless of time, place and device. 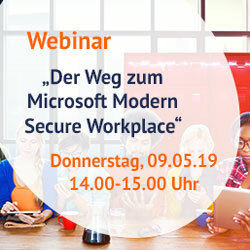 In the webinar „How BearingPoint manages customer projects with SharePoint and harmon.ie,“ we have an in-depth discussion with Birgit Englmayer, IT consultant, about the introduction, application and experience of harmon.ie by approximately 3000 employees at BearingPoint management and technology consultancy. Author: Michael Greth. This Product Review is sponsored by harmon.ie; the contents of the article are my own opinions.